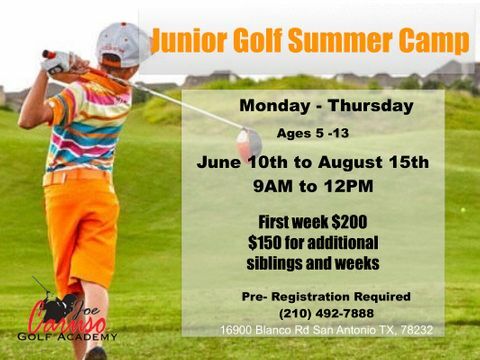 We are excited to offer our summer junior golf camp to children ages 5-13. 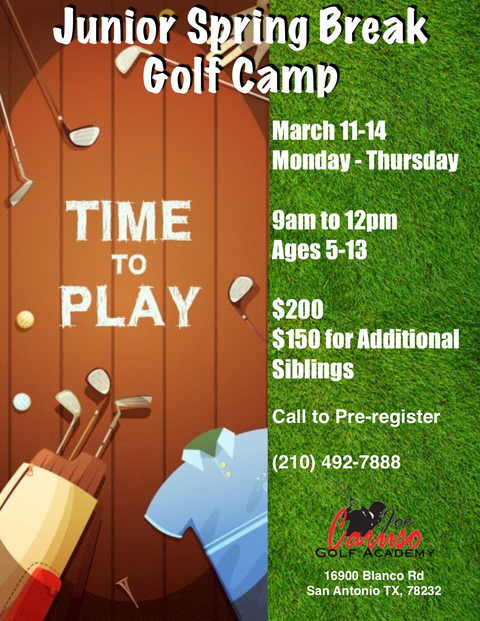 The Joe Caruso Golf Academy has been serving south Texas for 15 years in a state of the art facility with certified US Kids Golf Instructors. Whether its introducing your child to the game or improving their skills, this camp welcomes everyone and guarantees a fun time! First week $200 if you want to add any additional weeks of camp for $150. Register at Joe Caruso Golf academy or print the form and turn it into the Academy. 12 hours of instruction with certified golf instructor. Please be sure to drop your camper off with a full bottle of water. 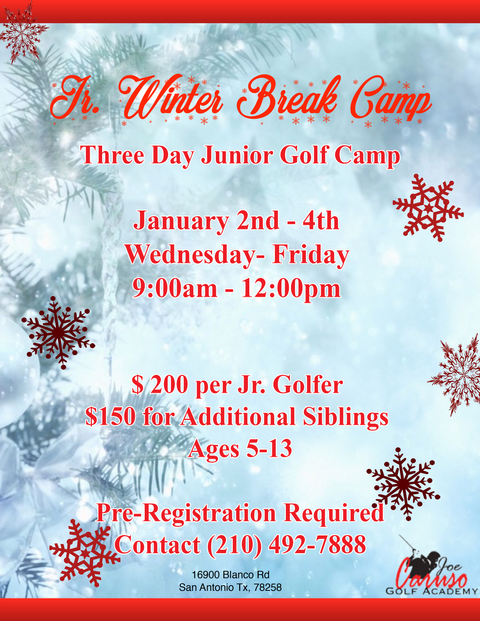 Have your Jr. Golfer join us for our annual Junior Christmas Camp. Call us at (210) 492-7888 to Pre-Register and for more information. 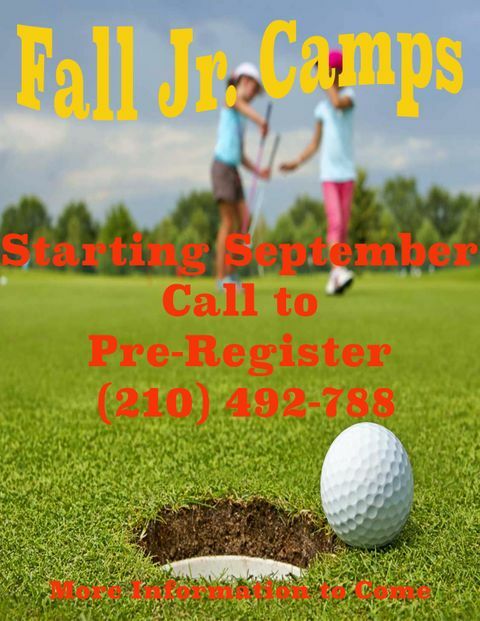 Pre-Register your Jr. Golfer for our three day Thanksgiving Camp. Change up your practice session with BirdieBall now offered at the Joe Caruso Golf Academy & Driving range, BirdieBall is the revolutionary off course golf "ball" that has won numerous awards and gathered much attention in the golfing world. Whether you are a beginner or a golf pro, you will truly be amazed. To participate in Birdieball simply purchase BirdieBall golf "balls" at the front desk. ID deposit required for the golf "balls"
Sign up your Jr. Golfer join us for our annual Winter Break Camp. Join us to participate in the Spring Break Jr. Golf Camp. This camp will be held Monday to Thursday from 9AM to 12PM. Our age range for this camp is 5yrs to 13yrs and we are able to accommodate all skill levels. Our Goal for this camp is to help further the Junior Golfers knowledge and skill of the game. For more information or to pre-register please contact us at (210) 492-7888. Host your next event at the Joe Caruso Golf Academy! We offer a range of services to accommodate your needs and desires for your very own special event. Whether you are planning a small gathering or any large special occasion, we can customize a private event to fit your needs.